Goat Hill Farm - Established in 1861. Well-appointed 5 bedroom, 5 bath Cape Cod-style main house and 2 bedroom guest house surrounded by 36 acres of magical land and approximately 2,000 feet of Galien River frontage. This one-of-a-kind property is pristine. Features include an in-ground pool enveloped in mature Wisteria, a 3-acre horse pasture with 5 stall barn, tack room, 40 x 50 foot pole barn that is great for storing all the big toys, backup generator system. 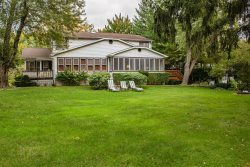 This property is very private yet within a few minutes drive to the amenities of Lake Michigan beaches, restaurants and wineries.